← We’re on the move! Here at Adventures with Poopsie, we chronicle our path to early retirement and a life of full-time travel. While this goal is still around eight years away, travel has been and remains a very important part of our lives. This is the first post in our very first series: Where We’ve Travelled. In this series, I will chronicle places we have travelled, either alone, or together. The aim here is to show you a variety of different locations, the good and the bad, and hopefully encourage you to pack your bags and go exploring yourself. Some of these trips took place almost eight years ago, so the information I provide will be fairly generic, as I may no longer be aware of specific places I stayed or of specific costs. However, I will aim to provide some links so that you can explore specifics on your own. 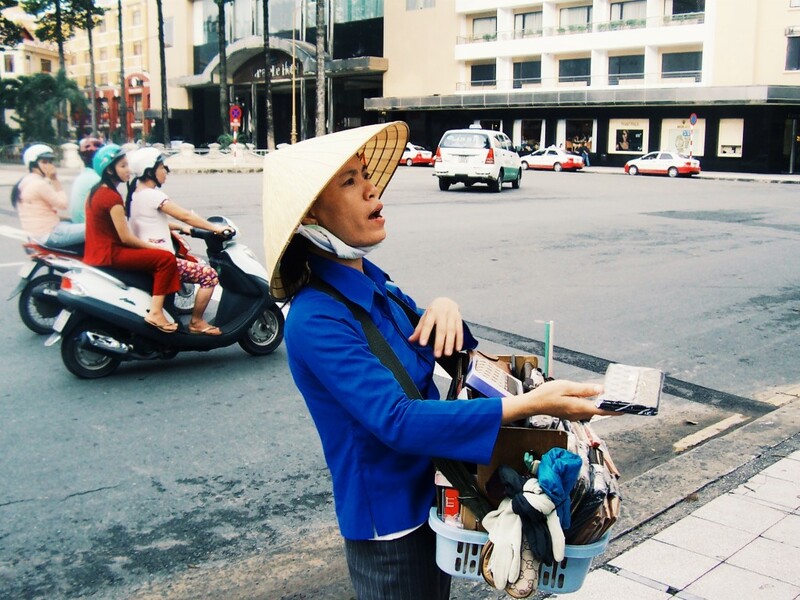 The first place profiled is… Vietnam. 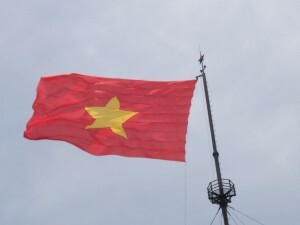 I went to Vietnam in 2008, during my second year of university. It was a trip organised by my uni and was dubbed a Battlefield Study Tour. All this meant was we visited a number of battle sites from the Vietnam War- but we still saw all of the regular tourist spots. 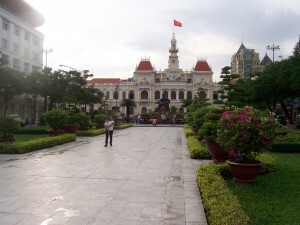 We spent the majority of our time in Ho Chi Minh City, and also visited Danang, Hue and Hanoi. Just outside of Ho Chi Minh City, the Cu Chi Tunnels are leftover from the war. An entrance into the tunnels. 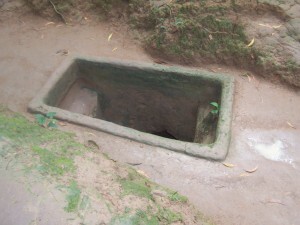 During the war, the Viet Cong dug tens of thousands of miles of tunnels. 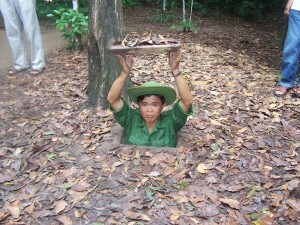 Amazingly, the Cu Chi Tunnels are still in excellent condition. 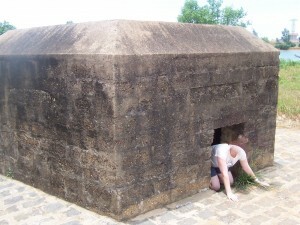 When you visit, you can crawl through the tunnels, see some of the booby traps that were used and, if you want, fire a range of guns on the gun range, including an AK-47. I personally didn’t go on the range, but those I was with did and thought it was great fun. I highly recommend visiting the tunnels, the history is amazing and the intricate and tiny tunnels are works of engineering genius. One of the guides showing how small the entrance to the tunnels were. As an Australian, it’s hard for me to get excited about a beach as I wholeheartedly believe we have the best beaches in the world. However, I was pretty impressed by China Beach. We only visited for a couple of hours, but I know people stay nearby and spend a lot of time here. The water was a beautiful blue, the sand was stunning and somehow, we managed to visit at a time when there didn’t appear to be anyone else there. Hoi An is nearby. 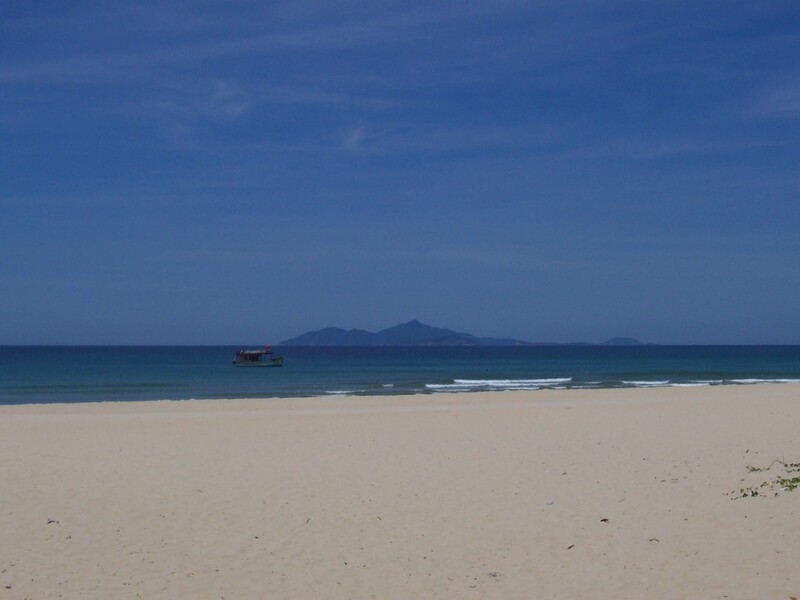 I didn’t visit there, but it is considered one of the most popular destinations in Vietnam. The DMZ marks the former border between North and South Vietnam. For anyone interested in the history of the war, this is definitely the place to visit. Me burrowing out of a bunker. There’s a great museum and some leftover bunkers you can crawl around in. Me at the North/South border bridge. You can also cross the bridge and technically straddle the border. I found the DMZ really interesting and highly recommend it. Without a doubt, the highlight of my trip was visiting the sight of the My Lai massacre. Places of profound tragedy are often memorialised and it’s disappointing when that is done in a commercial and touristy way. This is not the case with My Lai. 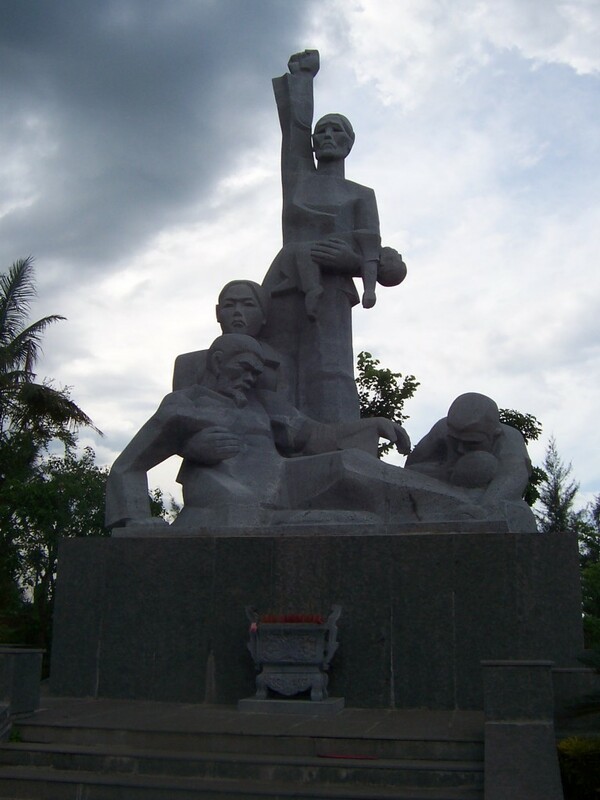 The My Lai memorial statue. The memorial is incredible. I admit I didn’t know a lot about the massacre before going but I walked away very informed and interested to learn more. We were able to meet a survivor of the massacre. Speaking to us through a translator, her words were very moving. A mixture of sadness and fascination bring people to My Lai and it’s a place I highly recommend. 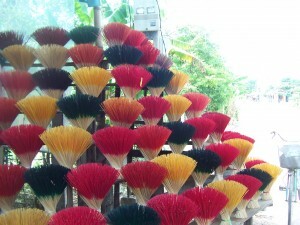 Some beautiful incense on sale in one of the many markets. There you have it, a few highlights from Vietnam. The best part of my trip, however, was just spending time in the cities, especially Ho Chi Minh City. The people were so friendly, there were scooters absolutely everywhere and the food was delicious. The colonial buildings were beautiful. A lot of people get suits and clothing made in Vietnam. A lot of the group I travelled with did – including me. I still have the two suits and two cocktail dresses I had made and while there were a few years where they no longer fit me, they do now and I continue to wear them. The quality was excellent. 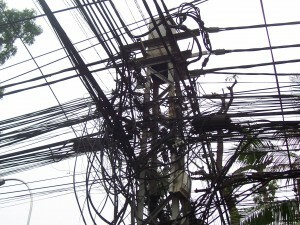 Some of the power lines in Ho Chi Minh City. Have you ever been to Vietnam? What did you think of it? This was an interesting read — thanks! I’ve been to other parts of Asia, but never Vietnam, and I really want to see it. My dad was there for the war and despite being there under obviously less than ideal circumstances, he always says it was a beautiful place full of the most friendly people. Wow, I bet he can offer a really interesting perspective. It’s definitely a place I recommend. Thanks for stopping by! That beach looks amazing. Thanks for sharing.